First and foremost Chickasaw jeweler Kristen Dorsey is an artist, perfecting her method of storytelling using metal and stone as her medium. Born and raised in southern California, she currently resides in LA which has proven to be a great source of inspiration for her latest collection, Of Earth and Place. In this collection, Kristen pays homage to two places that are very close to her heart. The Art Deco architecture of her city provides a modern framework to embellish with motifs of plant species native to the homelands of her Chickasaw ancestors. Kristen also creates one-of-a-kind pieces that offer her a unique vehicle to explore her inspirations. Working in this way, she is able to focus her vision in a manner that does not lend itself to duplication. Favoring fine cut gemstones and mixed metals formed by intricate repoussé work, she creates showcase pieces which become wearable sculpture with an uncommon narrative. 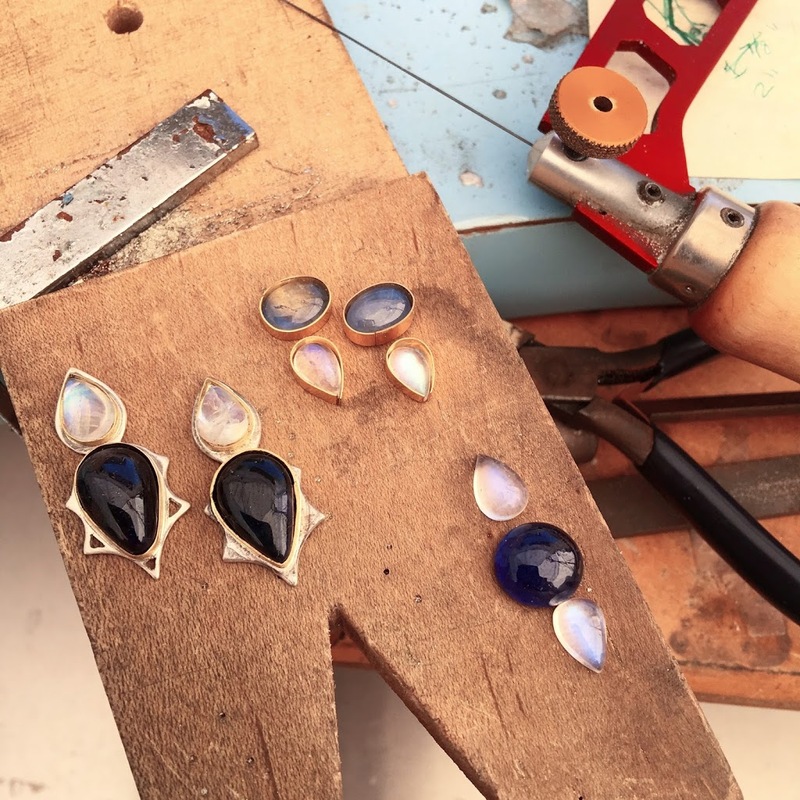 Photos from Kristen’s trip to Vietnam where she found inspiration for her latest series of one-of-a-kind jewelry. On a trip to Vietnam last summer she found the inspiration for her latest series of one-of-a-kind pieces. While she and her husband were visiting a temple in Hanoi, she noticed a nearby family-run gemstone shop. It was there that Kristen was lured by the beauty of the Star sapphire, one of the main gemstone materials found in Vietnam. 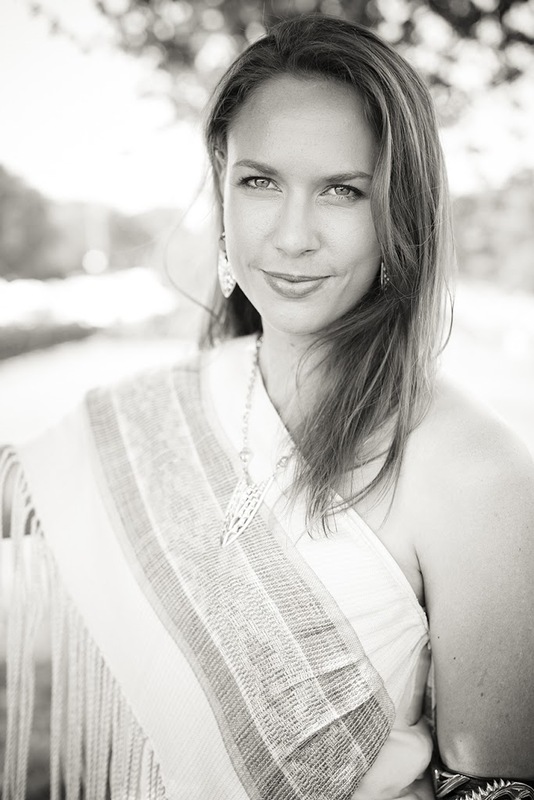 After returning home, Kristen set forth designing pieces that would reference the beautiful landscape and culture of Vietnam, her own intrepid journey, and her embodiment of Chickasaw cultural memory. Star Sapphire selection and design process. To learn more about her design process and the inspiration behind her work we asked Kristen a few questions. What was your upbringing like? Were you a creative child? I grew up in southern California (where I live today) and was nurtured by a family of artists and scientists. My father, a marine biologist professor, instilled in me a love of the ocean and our local environment, and my mother, an RNBSN at UCLA, specializes in geriatric medicine and instilled in me the importance of caring for our elders. Since I could hold a pencil in my hand, I have created art (or so I am told by my mother). As a child I would constantly draw and create. I became enamored with fashion and design as a high school student and have been ever since! So many places! I love discovering the art forms and especially jewelry of other artists around the globe. I would absolutely love to explore Morocco, Iceland, and Ireland (where my father’s side is originally from). As a surfer, I am dying to go to Fiji, Bali, and the Maldives. I would also revisit Greece, Costa Rica, Australia, and Aotearoa (New Zealand). However, right now I want to travel to places like the Standing Rock Sioux reservation to assist in the effort to prevent the Dakota Access Pipeline river crossing. What called you to become a metalsmith? I always knew that I wanted to create my own design-oriented company. In my freshman year of my dual degree program with Tufts University and the School of the Museum of Fine Arts I took a beginning jewelry class. Working with metal was unlike any other medium that I had used because it was incredibly challenging. This challenge fascinated me and drove my desire to learn and grow in this unique art form. What is the first piece of jewelry you made? The first piece of jewelry I made was a silver ring with a stamped design representing the four directions. This was my first soldering project so I ended up melting it and had to patch it up. It took such a long time to finish because of that! You are more or less a one-woman show and incredibly productive. What does a typical day look like for you? It really varies depending on my current event schedule and projects. Usually, I start the day off with a surf session followed by a giant latte! Then I will hop on the computer to return emails, usually concerning the KDD marketing workflow, website updates, customer service, and shipping that my two part time staff help with, then in the afternoons I log studio hours, and/or prep for upcoming shows. Often after or during dinner I will catch up on more computer work which can range from show applications, to blog posts, to volunteer work. As of recently, I have been making time in my schedule for political engagement. I call my elected officials, raise funds for causes I care about through sales, write letters, and participate in protests, especially surrounding issues that impact Native communities such as the Dakota Access Pipeline and other environmental concerns. I am also launching a new volunteering component of my company and will be spending some time each month at the Downtown Los Angeles Women’s center assisting with their amazing programs. However, my favorite days are spent hanging out with my husband and our two dogs – after a good surf session. It has always been my dream to inspire and empower other women. I design every piece to celebrate the unique strength that I believe all women possess. It fulfills me and fuels me when my clients tell me how they feel powerful and confident when they wear my pieces. It is also incredibly rewarding to be able to use my business as a tool for positive change. In November, I launched a campaign to donate 50% of proceeds of my small shield pendants to the Standing Rock effort. So far we are at $1,394. I am also really excited to be launching a new philanthropic aspect to my business. Beginning in March, I will be donating 10% of my website sales and donating my time to one new organization every three months. The first organization will be the Downtown Los Angeles Women’s Center which supports homeless women with a variety of important services. I am really looking forward to creating a positive impact within my community through my jewelry. Hmm, probably from my mother- she is constantly reminding me to do things to take care of myself and my health. One-of-a-kind pieces available at Four Winds Gallery. Captivating moonstones and sapphires are paired with fine silver and 22k gold. Does your inspiration ever attract you to work with specific materials or do the materials inspire the work? It can be either! Sometimes I will find an amazing gemstone or significant material and that will be the spark for a new piece. Other times I will design a piece and then find the perfect materials to further the meaning and my aesthetic goals. You have a strong connection to your Chickasaw heritage which is very apparent in your pieces. How has your relationship to that part of yourself evolved through your work? I believe that it has always driven my work. Ancestors of Chickasaw people were incredible artists who experimented with new materials, and pushed the boundaries of their craft. Many of my designs celebrate their work and pay tribute to the Chickasaw homelands in the southeast. I am also inspired by the stories of our female leaders throughout history. Creating jewelry inspired by them connects me to them. In modern Native American jewelry there are a lot of younger artists such as yourself who do not work in the traditional Navajo and Pueblo-based designs. What are your thoughts on helping people to recognize that Native made jewelry goes beyond silver and turquoise? While I admire Navajo and Pueblo jewelry and am friends with many jewelers in those traditions, I am not Navajo, I am Chickasaw. When I launched my company, I knew that I wanted to create work that would generate interest in Chickasaw art with the ultimate goal of paving the way for future Chickasaw jewelers. Unfortunately, progress is slow and while the demand for southwestern-style jewelry is great, the awareness of other regional styles and artists remains small. What people forget is that Native America covers every inch of this continent. This is all indigenous land and everyone should make an effort to learn about their local indigenous populations. This includes individuals, galleries, boutiques, museums, and other learning institutions. I believe that market demand will grow through awareness. Are there any artists who have inspired you in a big way? I have always been inspired by the Mexican muralist movement. I began to study it in high school and learned about the men and women who created powerful narratives through colorful symbolism. These murals made political statements and also incorporated indigenous roots. In California these murals are an important part of our local histories. As a jeweler I am inspired by René Lalique, a french art nouveau master who utilized chasing and repoussé, enamel, and gemstones to create delicate, organic masterpieces. However, my biggest inspiration for my current body of work stems from the artists crafting exquisite adornment in the Chickasaw homelands during the 1200-1500’s. These artists created intricate relief sculptures from copper as well as mica sheet and carved stones and pearls. Their craftsmanship is extraordinary despite the lack of modern tools. Your work has always served as a medium for telling the story of your indigenous background. Early in your career you made a lot of one-of-a-kind showcase pieces with a strong statement attached. Can you talk to us more about those pieces and if you have any future plans to revisit this kind of work? These are my favorite kinds of pieces to create, but they take months and months of intricate labor and lots of time! One of these pieces is titled “Blood Bling.” It is a photo etched Certificate of Degree of Indian Blood which is issued to all individuals (with documentation) from federally recognized tribes. 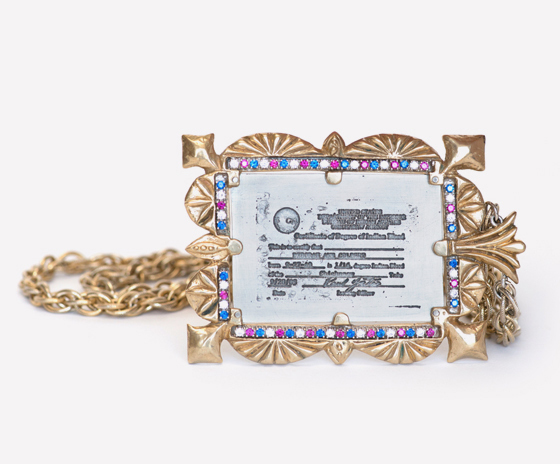 It is set in a hand carved bronze frame set with cubic zirconia in American flag colors. It is my commentary on the weight given to the concept of blood quantum – a non-Native concept which was used as a tool of colonization. This tool of colonization negatively affects Indigenous peoples who must apply for their CDIB cards from the American government in order to prove their cultural identities. The irony of this is that no other ethnic or cultural group must apply for membership to the United States Government. The controversial cards are both a tool of power, yet are deemed necessary for native nations to identify true members. Each tribal government handles the blood quantum issues differently, however it remains a troubling and divisive issue for most Indigenous peoples on this continent. My BA from Tufts is in American Studies, concentrating in Native Studies. Because of my academic background, I am deeply aware of the misrepresentation and absence of real Native American history within our education system. I feel called to teach about historical periods and issues of Native identity through my work. I am also very excited that the Oneida Nation is including my art in their upcoming Blood Quantum Anthology which features prominent Native scholars, poets, authors, and artists. I enjoy creating political/social/historical commentary through jewelry. I have some new political pieces planned for 2017. If you could collaborate with one other artist who would it be? I love the work of Christi Belcourt. I think that her detailed botanical paintings have a beautiful sensitivity which is uniquely combined with a bold color palate. I absolutely swooned over her Valentino collaboration, and it would be really fun to create wearable art with her. Her work is grounded in her knowledge of her culture and environment, which is inspiring to me. That’s a difficult question. I am such a perfectionist that I am never quite satisfied with a piece. The beauty of metalsmithing is that you are always learning and perfecting your skills. This is why I try to create different pieces to challenge myself and grow as an artist. I am still proud of my “Panther Woman” hair comb, my “Breath of Life” gorget, and my stingray breastplate and ring (on display in Native Fashion Now). Are there any new collections that you are working on that you can tell us about? Can you keep a secret? Just kidding… I am beginning a collection based on stories of Chickasaw hatchet women. In the 1700s If the men were away, Chickasaw women would defend their villages armed with hatchets which they apparently used very effectively. They were feared by the French soldiers who had hopes of raiding Chickasaw villages but gave up when they were brutally defeated by our women. I am feeling the need for some especially fierce jewels for these times we are living in today.